I know, I know. A dessert with beans? Adzuki beans are famous for their sweetness and I have served this to unsuspecting kids and adults alike and the reaction is always the same. “Seriously? There are beans in here?” You must try. Although you can use canned adzuki beans, I recommend starting with dried beans as the canned ones never become creamy enough for this dessert. Cook the adzuki beans according to regular dry bean cooking methods. If using pecans or cashews for the topping, save time and cleaning by placing them in a food processor or blender and blending the nuts. Remove from the food processor and place in a shallow bowl or plate. Set aside. In a food processor or blender (use the same one you used for the topping if you made the topping), combine ¾ cup cooked adzuki beans (they will have swollen up so your 1/2 cup should have turned into at least 3/4 cup), pecans, dates, cocoa powder, vanilla, salt and brown rice syrup. Blend until smooth, scraping down the sides of the bowl if necessary. If it is too dry to blend well, you can add a little more brown rice syrup to make it a bit more moist. Place the dough in the fridge for at least an hour so it cools and becomes easier to work with. 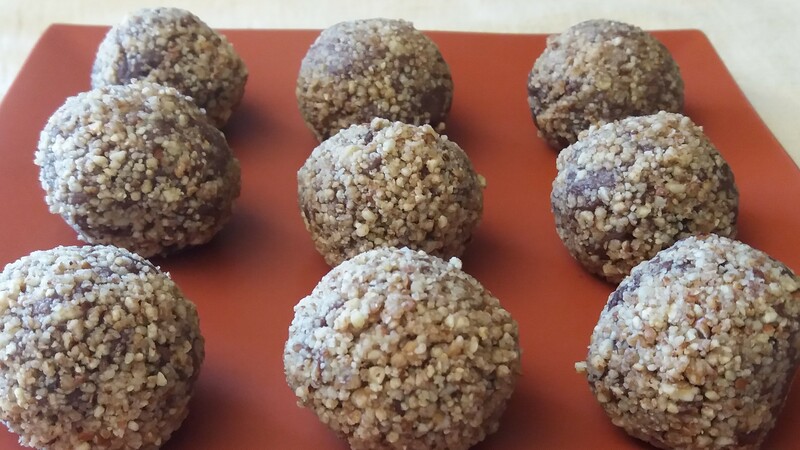 To form the bites, scoop out a tablespoon or so of dough at a time and roll into balls. Roll them in the topping until they are coated. Either serve or place in the fridge to firm up further and then serve. These freeze very well in mason jars.